When I am wondering if the weather is warm enough to ride my motorcycle, all I have to do is look out the window of my home office. If the kids next door are running around screaming in bare feet and T-shirts, I know I probably won’t freeze or be struck by lighting. Finding current weather conditions at Lake Allatoona is a little more difficult. Life around Allatoona Lake — its official name — is practically perfect in every way. Learning about current weather conditions, lake level and the timing of discharges at Allatoona Dam is a bit imperfect. For stuff like the level of Allatoona, the water surface temperature or rainfall in the past 24 hours, you can get a recorded message from the US Army Corps of Engineers (USACE) by calling 770-386-0549. 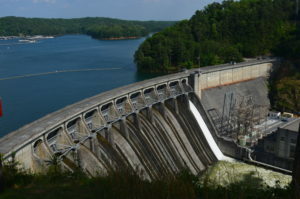 Watching water being released at Allatoona Dam can be thrilling. The “rapid rises and turbulent flows” downstream can also be thrilling — but dangerous. If you plan to fish below the dam, please call 706-334-7213 for the latest recorded information on when water will be flowing. Yes, the Weather Channel has a forecast for the lake. It might not be the best for navigational safety, but you can always zoom into the radar to see where storms might be and where they’re going. Better to be cautious. Still need help? You can call the USACE Offices at Allatoona for other information at 678-721-7600.